Speech-impaired driver: "But I’m certainly not deaf. My eyesight is sharp and my mind is clear. So, be rest assured that you’re in safe hands when you sit in my car." Grab community – From a limitless reserve of patience for disgruntled passengers to offering karaoke during a ride, there are lovely Grab drivers who go the extra mile to ensure their passengers’ comfort, enjoyment and safety during the trip. The following Grab driver offers this first-class service with his silent rides. A certain Eve SH went to Facebook and uploaded a feature of a Grab driver who gives out a note to his passengers offering different types of rides. Although a hilarious guy in reality, the driver mentioned his condition of not being able to promptly speak out his thoughts which could create awkward silences. He optimised his situation and created three different rides which his passengers could choose: The Silent, Therapy, or Friendly Ride. You may have noticed that I’m a very quiet guy. That’s because I believe Silence is Golden. I’m actually so hilarious. I’m the only one who gets my jokes. The truth is I was born with a speech problem. After words have been formed in my brain, it takes a long time for them to be sent to my mouth to be spoken out. I don’t know why, nor do the doctors. Perhaps the audio system in me is somehow wrongly wired. But I’m certainly not deaf. My eyesight is sharp and my mind is clear. So, be rest assured that you’re in safe hands when you sit in my car. I can bring you safely to your destination. If you are having a bad day, my ears are all yours. And so are my shoulders for you to cry on. I can smile and wink at you from time to time in the rear-view mirror. Let me take this opportunity to let you know that I appreciate your using my humble grab car service. 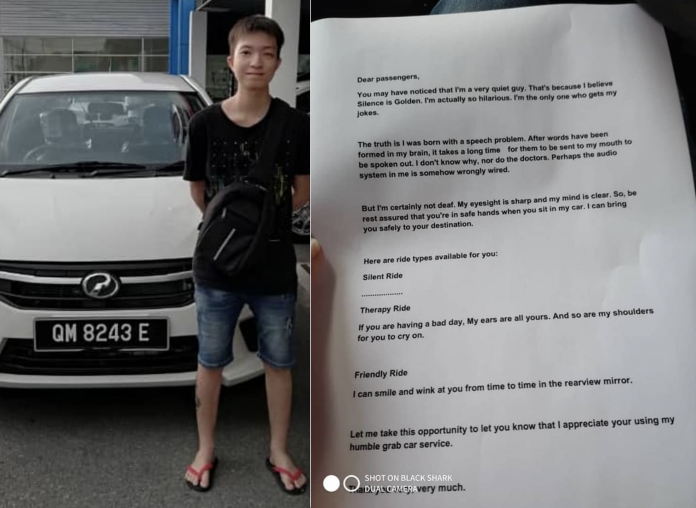 A photo of the driver who looked like a sweet and gentle guy was also posted. Grab customer’s mistake wastes food. So, driver gives food to old man on the streets.